There’s a popular statistic doing the rounds that says there’s about 160,000 charities in the UK right now. That’s quite a figure, but it’s actually some way off. In reality, it’s closer to over 400,000. That’s an awful lot of collection jars being rattled up and down the country. Which of course is a good thing. It’s also an indication of just how many people are involved in setting up and running charities, social enterprises and community interest companies. Anyone, it seems, can be in charge of a charity. The problem is that many of these people probably won’t realise what that actually means. In other words, that they’re a trustee. There’s evidence suggesting that over half the general public don’t know what a trustee is. If that’s to be believed, it’s reasonable to assume that a significant number of trustees don’t actually know they’re trustees either. Which, in legal terms, is a risky place to be. Because if something goes wrong, all those good intentions could be forgotten. A claim against you or your charity isn’t a good time to find out that your personal assets, as well as your charity’s future, are at stake. So, what’s a trustee? Put simply, it’s whoever’s in charge of raising and investing charity funds. 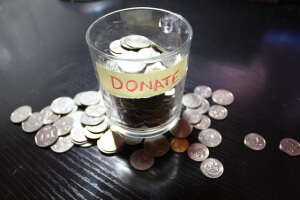 You could be running your own local-interest micro-charity. Or you could be one of several trustees on the board of an international aid agency. Often, the work you do is unpaid. What’s common to all trustees is the responsibility to run your charity correctly. Allegations that this hasn’t happened can and will be levelled at individuals concerned. Trustees, you see, are personally liable for the consequences of their decisions. The fact is that, in legal terms, a charity is no different to a business. And a trustee’s duty of care is no different to a company director’s. Just because you’re in it for the good of others makes you no less vulnerable, unfortunately. So what sort of risks could you be liable for? Well, you’ve probably seen a few unsavoury headlines about mismanagement of charity funds recently. And that’s certainly one of the most common causes of claims. Unfair dismissal. If you have to show an employee the door, make sure you’ve crossed all the HR ‘T’s and dotted the employment law ‘I’s. Allegations against individual trustees from disgruntled ex-employees are common and very expensive to defend. Breaching health and safety regulations. Making sure your charity’s property is well maintained and complies with H&S regulations is a prerequisite. If one trustee has responsibility for this, he or she could be liable if an inspection turns up recurring problems. Defamation. Banging the drum about your charity is fine. Doing it to the detriment of another charity with similar aims isn’t. False or misleading statements in publicity material can easily lead to legal action against the trustee(s) responsible. So there you have it. Quite a mix of things to worry about. All these allegations carry a heavy price. Combine the cost of legal fees, expenses and possible payouts, and you could soon find your bank balance looks pretty barren. Charities’ and trustees’ insurance (also known as trustees’ indemnity) is there to protect you if you find yourself in a pickle. You’ll get a specialist legal team to fight your corner and, if you’re found to be in the wrong, it’ll also pay out any compensation. For more information, call us on 0345 222 5399, or click here for a quote.